The Finnish Air Force (FAF or FiAF) (Finnish: Ilmavoimat ("Air Forces"), Swedish: Flygvapnet) ("Air Arm") is one of the branches of the Finnish Defence Forces. Its peacetime tasks are airspace surveillance, identification flights, and production of readiness formations for wartime conditions. The Finnish Air Force was founded on 6 March 1918. The first steps in the history of Finnish aviation were taken with Russian aircraft. The Russian military had a number of early designs stationed in the country, which until the Russian Revolution of 1917 had been part of the Russian Empire. Soon after the declaration of independence the Finnish Civil War erupted, in which the Soviets sided with the Reds – the socialist rebels with ties to the Bolshevik Party. Finland's White Guard, the Whites, managed to seize a few aircraft from the Soviets, but were forced to rely on foreign pilots and aircraft. Sweden refused to send men and material, but individual Swedish citizens came to the aid of the Whites. The editor of the Swedish daily magazine Aftonbladet, Waldemar Langlet, bought a N.A.B. Albatros aircraft from the Nordiska Aviatik A.B. factory with funds gathered by the Finlands vänner ("Friends of Finland") organization. This aircraft, the first to arrive from Sweden, was flown via Haparanda on 25 February 1918 by Swedish pilots John-Allan Hygerth (who on March 10 became the first commander of the Finnish Air Force) and Per Svanbäck. The aircraft made a stop at Kokkola and had to make a forced landing in Jakobstad when its engine broke down. It was later given the Finnish Air Force designation F.2 ("F" coming from the Swedish word "Flygmaskin", meaning "aircraft"). The insignia of the Finnish Air force 1918–1945. 29 Swedes (16 pilots, two observers and 11 mechanics). Of the pilots, only 4 had been given military training, and one of them was operating as an observer. 28 Finns (four pilots of whom two were military trained, six observers, two engineers and 16 mechanics). The air activity consisted mainly of reconnaissance sorties. The Germans brought several of their own aircraft, but they did not contribute much to the overall outcome of the war. The Winter War began on 30 November 1939, when the Soviet Air Force bombed 21 Finnish cities and municipalities. The Soviet Union is estimated to have had about 5,000 aircraft in 1939, and of these, some 700 fighters and 800 medium bombers were brought to the Finnish front to support the Red Army's operations. As with most aerial bombardment of the early stages of World War II, the damage to Finnish industry and railways was quite limited. At the beginning of the Winter War, the Finnish Air Force was equipped with only 17 Bristol Blenheim bombers and 46 fighters (32 modern Fokker D.XXIs and 14 obsolete Bristol Bulldogs). There were also 58 liaison aircraft, but 20 of these were only used for messengers. The most modern aircraft in the Finnish arsenal were British-designed Bristol Blenheim bombers that had been built under license in Finland. The primary fighter aircraft was the Fokker D.XXI, a cheap but maneuverable design with fabric-covered fuselage and fixed landing gear. On paper, this force should have been no match for the attacking Soviet Red Air Force. However, the Finnish Air Force had already adopted the Finger-four formation in the mid-1930s, which was to be found to be much more effective formation than the Vic formation that many other countries were still using when World War II began. To prevent their aircraft from being destroyed on the ground, the Finns spread out their aircraft to many different airfields and hid them in the nearby forests. The Finns constructed many decoys and built shrapnel protection walls for the aircraft. Soviet air raids on Finnish airfields usually caused little or no damage as a result, and often resulted in interception of the attackers by the Finns as the bombers flew homeward. As the war progressed, the Finns tried desperately to purchase aircraft wherever there were any to be found. This policy resulted in a very diverse aircraft inventory, which caused some major logistical problems until the inventory became more standardized. The Finnish Air Force included numerous American, British, Czechoslovakian, Dutch, French, German, Italian, Soviet, and Swedish designs. Other countries, like South Africa and Denmark, sent aircraft to assist in the Finnish war effort. Many of these purchases and gifts did not arrive until the end of the hostilities, but were to see action later during the Continuation and Lapland wars. To make up for its weaknesses (few and obsolete fighters) the FiAF mainly focused on attacking enemy bombers from directions that were disadvantageous to the enemy. Soviet fighters were usually superior in firepower, speed and agility, and were to be avoided unless the enemy was in a disadvantageous position. An example of this strategy was the surprise attack on the Immola air base in late February 1940 by some 40 Soviet fighters. The Finns were surprised during take off and lost seven planes, one Fokker D.XXI and six Gloster Gladiators. As a result of these tactics, the Finnish Air Force managed to shoot down 218 Soviet aircraft during the Winter War while losing only 47 to enemy fire. Finnish anti-aircraft guns also had 314 confirmed downed enemy planes. 30 Soviet planes were captured – these were "kills" that landed more or less intact within Finland and were quickly repaired. For a complete list of Finnish units during 1941–44, see List of units of the Finnish Air Force during the Continuation War. The Finnish Air Force was better prepared for the Continuation War. It had been considerably strengthened and consisted of some 550 aircraft, though many were considered second-rate and thus "exportable" by their countries of origin. Finland purchased a large number of aircraft during the Winter War, but few of those reached service during the short conflict. Politics also played a factor, since Hitler did not wish to antagonize the Soviet Union by allowing aircraft exports through German-controlled territory during the conflict. In addition to Fokker fighters and Bristol Blenheim bombers built under license, new aircraft types were in place by the time hostilities with Soviet Union resumed in 1941. Small numbers of Hawker Hurricanes arrived from the United Kingdom, Morane-Saulnier M.S.406s from France, Fiat G.50s from Italy, and one liaison aircraft. Numerous Brewster F2A Buffaloes from the neutral USA strengthened the FiAF. A few dozen Curtiss Hawk 75s captured by the Germans in France and Norway were sold to Finland when Germany began warming up its ties with Finland. Captured Tupolev SBs, Ilyushin DB-3s, and Polikarpov I-153s were reconditioned for service. The FiAF proved capable of holding its own in the upcoming battles with the Red Air Force. Older models, such as the Fokker D.XXI and Gloster Gladiator, had been replaced with new aircraft in front-line combat units. The FiAF's main mission was to achieve air superiority over Finland and prevent Soviet air power from reinforcing their front lines. The fighter squadrons were very successful in the Finnish offensive of 1941. A stripped-down, more maneuverable, and significantly lightened version of the American Brewster Buffalo was the FiAF's main fighter until 1943. Results with this fighter were very good, even though the type was considered to be a failure in the US Navy and with British and Dutch Far East forces. In Finnish use, the Brewster had a victory rate of 32:1 – 459 kills to 15 losses. German Bf 109s replaced the Brewster as the primary front-line fighter of the FiAF in 1943, though the Buffalos continued in secondary roles until the end of the wars. Other types, especially the Italian Fiat G.50 and Curtiss Hawk 75, also proved capable in the hands of well-trained Finnish pilots. Various Russian designs also saw action when lightly damaged "kills" were repaired and made airworthy. While the FiAF was successful in its mission, the conditions were not easy. Spare parts for the FiAF planes were scarce — parts from the US (Buffalo and Hawk), Britain (Hurricanes), and Italy (G.50) were unavailable for much of the war. Repairs took often a long time, and the State Aircraft Factory was burdened with restoration/repair of captured Soviet planes, foreign aircraft with many hours of flight time, and the development of indigenous Finnish fighter types. Also, one damaged bomber took up workshop space equalling three fighters. The Finnish Air Force shot down 1,621 Soviet aircraft while losing 210 of its own aircraft during the Continuation War. These revisions followed Soviet demands closely. When Britain tried to add some of their own (fearing that the provisions were there only to augment the Soviet air-defences) they were opposed by the Soviets. The revisions were again revised in 1963 and Finland was allowed to buy guided missiles and a few bombers that were used as target-tugs. The FAF also used a loop-hole to strengthen its capabilities by purchasing large numbers of two-seater aircraft, which counted as trainer aircraft and were not included in the revisions. These aircraft could have secondary roles. Today, the FAF is organized into three Air Commands, each assigned to one of the three air defence areas into which Finland is divided. The main Wing bases are at Rovaniemi, Tampere and Kuopio-Rissala, each with a front-line squadron. Pilot training is undertaken at the Air Force Academy in Tikkakoski, with advanced conversion performed at squadron level. Boeing C-17 Globemaster III United States transport 3 As a member of the SAC, Finland has access to the C-17s, based at Pápa Air Base, Hungary. ^ "Finnish Air Force today". Finnish Air Force. Archived from the original (Web article) on 2008-02-12. Retrieved 2008-02-23. ^ a b "Armistice Agreement". Heninen.net. Archived from the original on 2014-01-28. Retrieved 2014-02-20. ^ "Finnish Air Force". Archived from the original on 7 August 2016. Retrieved 24 December 2014. ^ "Finnish Air Force History". Archived from the original on 1 March 2012. Retrieved 24 December 2014. ^ "Continuation War Aviation in Review". virtualpilots.fi. 2005-09-19. Archived from the original on 2014-02-26. Retrieved 2014-02-20. ^ "Avslöjande: Sverige lagrade jaktplan för finska piloter" (in Swedish). Hbl.fi. Archived from the original on 2014-02-27. Retrieved 2014-02-20. ^ a b c "World Air Forces 2018". Flightglobal Insight. 2018. Archived from the original on 2 December 2017. Retrieved 4 December 2017. ^ "Finnish Air Force Aircraft Fact Sheet: Boeing F/A-18C and F/A-18D Hornet" (PDF). Finnish Air Force. Retrieved 3 June 2018. ^ "Finnish Air Force Aircraft Fact Sheet: Gates Learjet 35A/S" (PDF). Finnish Air Force. Retrieved 3 June 2018. ^ "Finnish Air Force Aircraft Fact Sheet: Airbus Military C295M" (PDF). Finnish Air Force. Retrieved 3 June 2018. ^ "Finnish Air Force Aircraft Fact Sheet: Pilatus PC-12 NG" (PDF). Finnish Air Force. Retrieved 3 June 2018. ^ "Finnish Air Force Aircraft Fact Sheet: BAE Systems Hawk" (PDF). Finnish Air Force. Archived (PDF) from the original on 12 June 2018. Retrieved 3 June 2018. ^ "Finnish Air Force Aircraft Fact Sheet: Valmet L-70 Vinka" (PDF). Finnish Air Force. Archived (PDF) from the original on 12 June 2018. Retrieved 3 June 2018. ^ "Finnish Air Force Aircraft Fact Sheet: Grob G 115E" (PDF). Finnish Air Force. Retrieved 3 June 2018. ^ a b c d e f g Trade Registers Archived 2011-01-31 at WebCite. Armstrade.sipri.org. Retrieved on 2017-12-23. ^ "Puolustusvoimat". Archived from the original on 14 November 2006. Retrieved 24 December 2014. ^ "Puolustusvoimat" (in Finnish). Ilmavoimat.fi. 2014-02-14. Archived from the original on 2007-04-25. Retrieved 2014-02-20. ^ "Puolustusvoimat" (in Finnish). Ilmavoimat.fi. 2014-02-14. Archived from the original on 2007-09-05. Retrieved 2014-02-20. Shores, Christopher (1969). Finnish Air Force, 1918–1968. Reading, Berkshire, UK: Osprey Publications Ltd. ISBN 978-0668021210. 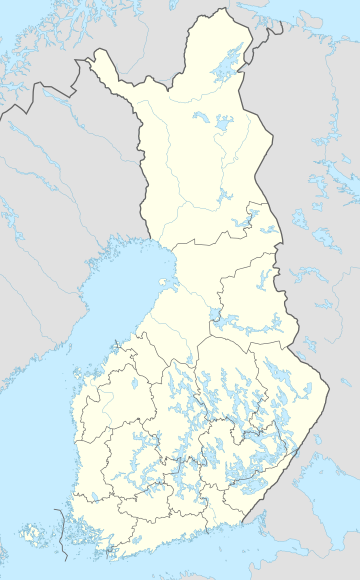 Wikimedia Commons has media related to Air force of Finland.